A survey by a pair of hill sleuths led to the separation of Highland twins. Two peaks above Glen Shiel that had previously been classified as a twin corbett were found to differ in height by about a foot, meaning one of the hills has been demoted. Corbetts are Scottish hills between 2,500ft and 2,999ft with a drop of at least 500ft around them. The on-off saga of the twin corbetts has been running for decades, but was decided by amateur surveyors John Barnard and Graham Jackson who, along with Andy Nisbet and Dave McGimpsey of the Scottish Mountaineering Club spent hours measuring the heights of the two hills. One of the hills first appeared in the original 1953 corbett list, but was then usurped by its northern neighbour before the two entered the books together. Accompanying the team this time was Charles Everett, who set the ball rolling years ago when he spotted a small ring contour on Buidhe Bheinn, one of the two twins, suggesting the spot height of 879m recorded for another top on the mountain might not be the highest point. In the end, OS agreed and gave both the new highest point and the height of Sgùrr a’ Bhac Chaolais, 2½km north, the same value: 885m (2,904ft) above sea level. And as there wasn’t a drop of 500ft between the two, they went into the SMC’s lists as a ‘twin corbett’. The party set off early on the morning of 5 September to determine the heights of the two tops, using professional Global Positioning System receivers with a high accuracy. 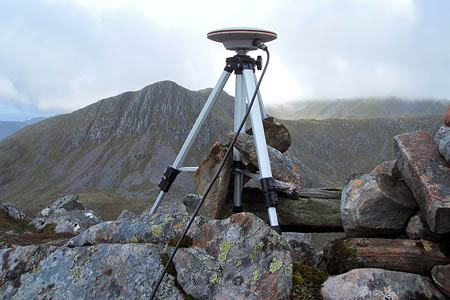 The surveyors, who have been responsible for Beinn a’ Chlaidheimh’s reclassification from munro to corbett status and the confirmation of Tryfan’s 3,000ft-plus status, reached the summit of Sgùrr a’ Bhac Chaolais and set up the equipment next to a small cairn on a rock outcrop, the highest point on the mountain. 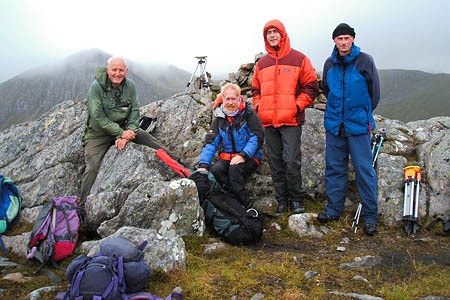 The team then split, with John Barnard remaining on Sgùrr a’ Bhac Chaolais while the others continued the walk over to the summit of Buidhe Bheinn. Data was collected for three hours from the two points before the party made their descent, after a total of 11 hours on the mountain. The data was sent to Mark Greaves at Ordnance Survey for post processing and the announcement of a definitive result. Andy Nisbet, Scottish Mountaineering Club president, said: “The day proved very enjoyable, albeit a bit wet in parts. “The result to two decimal places that the Ordnance Survey has confirmed and the measurement that the SMC will adopt, is that Buidhe Bheinn is 885.50m in height and that Sgùrr a’ Bhac Chaolais is 885.21m in height, this is a difference of 0.29m. “I can confirm that the SMC will now list the higher summit, Buidhe Bheinn, as the corbett. Great to see this article about our survey. As often the case, some inaccuracies. It was 16 years back when I badgered the OS with letters asking if they could supply a summit height for Buidhe Bheinn, having found, on the 1.25k Pathfinder map, that the metricised old imperial contour line of 884m (2900ft) on Buidhe Bheinns ENE summit indicated that it may be perhaps at least equal in height to Sgurr a'Bhac Chaolais. It just goes to show that whether you are doing the Munros or Corbetts, you should try and climb all significant 'tops', hills that have previously been classified, and all deleted Munros and Corbetts. As Hamish Brown once wisely said, why have a pass degree when you can have an honours degree? Buidhe Bheinn was a corbett before this survey - it was just not known which of the two was the highest, so both were listed. Now Bhac Chaolais has been dropped from the list. I wonder if anyone had Bhac Chaolais as their last corbett and completed in their armchair? It is worth doing tops though, as many of them are very enjoyable. This should have been one of the first targets of the resurvey and thank you for sorting it. Now which is the munro or top - Meall Garbh or An Stuc? Or will the modern trend of munro inflation keep them both in the list even then the highest of the pair is known.